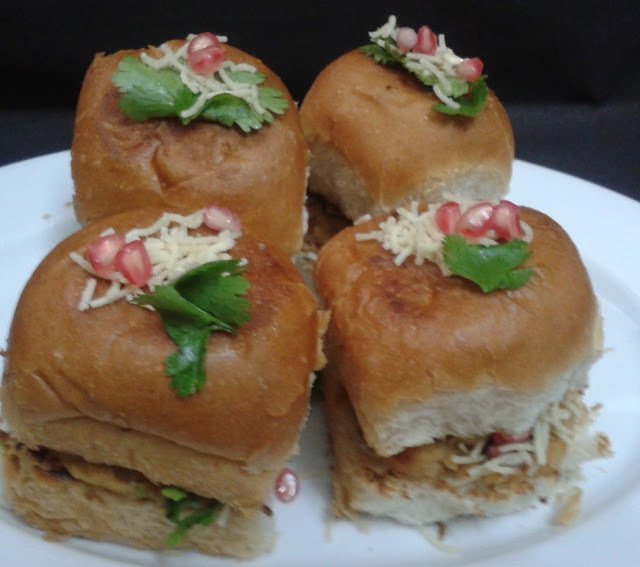 Roast all the ingredients listed under dabeli masala in a pan for 2 to 3 minutes. Grind to a fine powder in a blender. Heat the oil in a pan and add the cumin seeds. 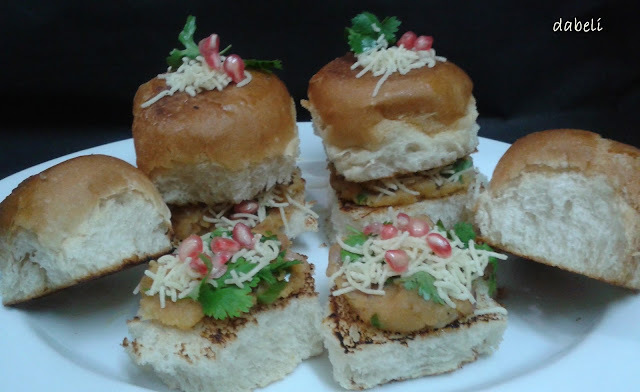 When they crackle, add the asafoetida, dabeli masala, potato and salt and mix well. Remove from the fire, add the 2 tablespoons of tamarind chutney and mix well. Keep aside. Slice the burger buns into halves horizontally and cook the buns in a pan using a little butter. Place a portion of the filling on the lower half of each bun. Top with the chopped onion, peanuts, coriander, sev, pomegranate , garlic chuttney and tamarind chutney. Sandwich it with the top halves of the burger buns and serve. 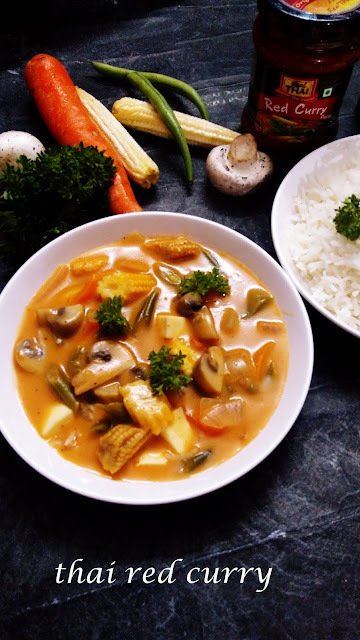 Combine all the ingredients listed under red curry paste in a mixer and blend them together into a smooth paste using as much water as reqiured. Or you can use 1 tbsp thai red curry paste readily available in market for one can of coconut milk. Heat the oil in a pan and add 5 to 6 tbsp of the red curry paste and cook on a medium flame for 1 minute. Add the basil and cook on a medium flame for 1 minute. Add the coconut-milk , cornflour-coconut milk mixture, ketchup and salt, mix well and cook on a medium flame for another 5 to 6 minutes, while stirring continuously. If required add 1-2 cups of water or thin coconut milk. Saute all the vegetables in a separate pan in a tbsp of oil till the become tender. then add all the vegetables to the curry and mix well and cook on a medium flame for 2 more minutes. Serve hot with plain or coconut rice. You can add vegetables like broccoli,peas or cottage cheese as per choice and availability. If lemon grass is not available add more of lemon rind and basil can be replaced with holy basil i.e. tulsi. 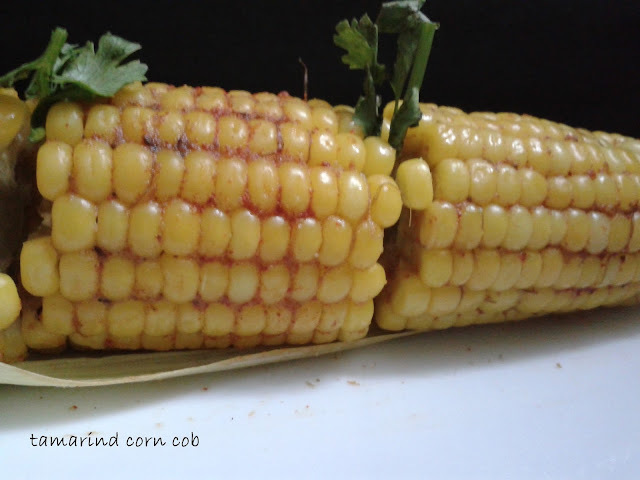 Peel the corn cob and put it in a pressure cooker with one cup water and 1/4 tsp of salt. Or you can cook it in microwave. Pressure cook till 3-5 whistles depending upon how ripe the corn is. Take it out and rub tamarind pulp,salt and chili powder and enjoy.